Medical Information, Health News & Tools. An allergic reaction to henna is rare, considering that pure henna is supposed to be one of the safest things that you can put on your skin. However, a lot of people add chemicals, such as phenylenediamine (PPD), to henna to make it appear darker and stay for longer. Almost all the allergic reactions to henna are because of these chemicals. The chemical ingredients that cause an allergic reaction usually include PPD, kerosene and other chemicals. In most cases, the allergic reaction will be limited to the area where henna is applied; however, it can also be widespread and have systemic effects. More severe symptoms of this allergic reaction are rare and can include loss of breath, watering eyes, redness all over the body and palpitations. Use steroidal cream for several days or until the symptoms disappear. A course of antibiotics may also be prescribed if there is a secondary bacterial infection of the area. Aloe vera containing gels are often used to provide a soothing effect in the affected area. The first thing to do is to check the ingredients on the package of henna. Remember that pure henna is made from henna leaves and the list of ingredients should not contain anything else. The natural color of henna is a greenish color which is not overly bright. 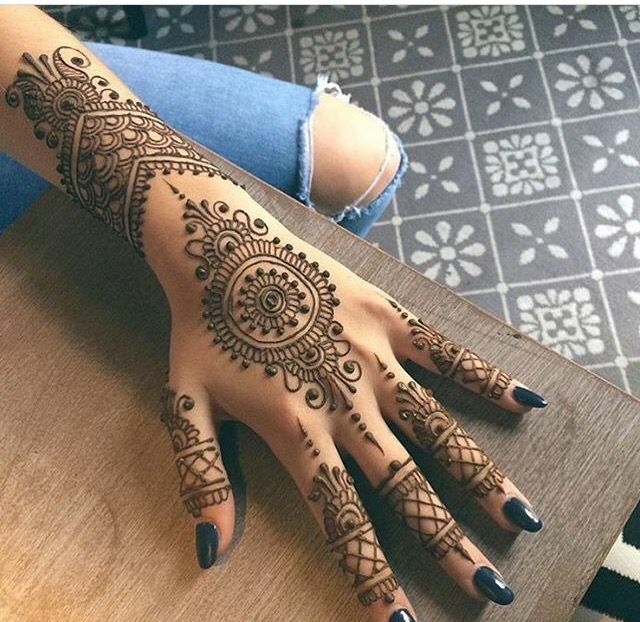 The smell of natural henna resembles that of grass. Commercially available henna tattoos that are mixed with chemicals have a very unpleasant smell. An easy test to check whether the henna is natural or not is to take a little bit of henna with a few strands of hair, and mix them with ammonia and some drops of peroxide. Nothing will happen if the henna is pure; however, the hair strand will change color if it is impure. Another way to see if the henna is natural is to check its texture. Natural henna spreads very evenly and smoothly on the skin, while the impure one tends to clump and spread in chunks. We would recommend avoiding any kind of store bought commercial henna pastes since they are likely to have some amount of chemicals. Instead, buy these from henna professionals. Remember that henna will always stain only in a shade of orange, red, brown or dark brick. Any other colors like green, purple, black or yellow will come from dyes that could be harmful to the skin. Find out what the other dye is or avoid colored henna altogether. It is unlikely that the addition of essential oils will cause an allergic reaction to henna. These essential oils are often added to make the henna more fragrant. The use of these essential oils with henna will do no harm. The addition of these solvents is a common practice in certain countries where artists want a darker, almost black stain of henna. Avoid any henna when you are able to smell these solvents. This is another product that is added to make the henna stain very dark. Commonly used by henna artists in South India, camphor can cause allergic reactions. We recommend that any henna products which have camphor added to them be avoided completely. Different people have different tolerance to citrus oils; however, they are known to leave the skin patchy and itchy, and cause peeling. You may want to avoid henna that smells citrusy to prevent the above mentioned allergic reactions. Anyone who has a nut allergy should be very careful to make sure that no walnut powder has been added to the henna. This is a common practice in certain parts of the world and can cause some very dangerous anaphylactic reactions. This is a kind of dye that is added to henna to make it darker. An allergic reaction to henna may happen if black kattam has been added to it. 8. Black Rocks from the Nile and "Henna Stone"
A lot of people disguise PPD as henna stones or black rocks from the Nile and take advantage of gullible people. If you hear these words, avoid buying henna from them. Note: There is a skin test available for people who have never used henna before. It is called the naphthoquinone sensitivity test. If you are positive to it, then you should avoid henna use at all costs. What Causes Dry Patches on the Face? CopyRight © MedGuidance.Last Updated 18 April, 2019.